A fun way to produce or change items right in front of your audience! 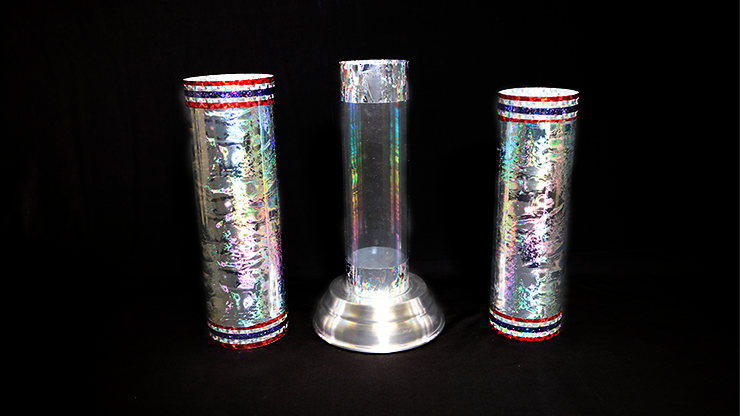 A set of three acrylic tubes... a clear one mounted in a beautiful spun aluminum base and two larger opaque ones, all nested inside of each other. The outer tubes are removed, showing them and the inner tube unmistakably empty. A silk or other object is dropped into the clear inner tube. They are reassembled as the magic words are spoken. Upon their removal, the object has magically changed and the inner tube is FILLED with candy, balls, rope, balloons or whatever you want to load inside!